We all used IC 555 in many applications. Why it is called as 555 Timer? There are three 5K resistors inside the IC that makes it as versatile IC for Timer applications. IC555 was introduced in 1971by the Signetics corporation as SE555 / NE555 and was called as “IC Time Machine”. 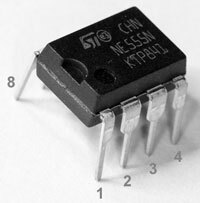 Later its CMOS version IC 7555 and Dual Timer IC 556 were introduced.